My mum is the type of person that loves making jam. Seriously, every time I'm at hers, she's either in the middle of making some or wants to give me a jar or two as she's doubled her stash. Needless to say, my cupboard is full of her jam, from strawberry and prosecco to rhubarb and ginger, but my absolute favourite that she makes is the solid and classic raspberry, which was my basis for this recipe. I can't say no to taking jam off her, but my cupboards needed a clear out and the only way I saw fit to use her raspberry jam was to bake with it! 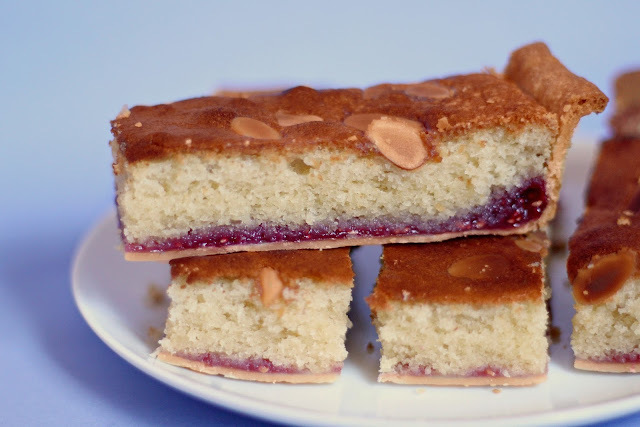 And of course, as soon as I started to think about bakes that included jam, my mind jumped straight to bakewell slices - almondy, jammy, delicious bakewell slices. I normally have a fair amount to say about why I baked something or the ins and outs of how to get your bakes to look like mine, but I feel like absolutely everyone and their cat knows what an almond slice is. 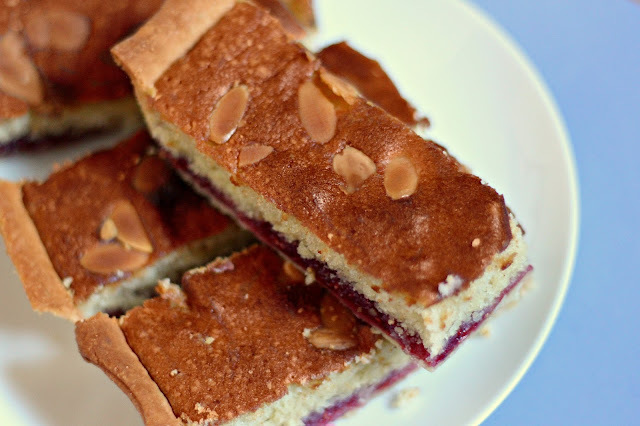 It's beautifully browned, sweet shortcrust pastry, topped off with a layer of raspberry jam and baked almond sponge. Luckily for me, I had some shortcrust pastry in the freezer, but you can easily buy some or make some of your own (here is a really easy, fab recipe). With some flaked almonds on top and maybe a little sprinkling of icing sugar, if you're feeling particularly naughty, you're good to go! In our house, we enjoyed these warmed up with a little bit of custard, but it's also pretty delicious served cold. It also freezes really well, so if you need to bake in advance, you totally can! Preheat your oven to 200c/180c fan/gas mark 6. Grease and line a traybake tin with greaseproof paper. Dust your clean countertop with plain flour and roll out your pastry until it is the correct size for your tin, then gently lift it in and press it into the corners. Prick the pastry all over with a fork, then pop it into the fridge for 20 minutes. Once the pastry has chilled, bake for 8-10 minutes until cooked, but not too coloured. You want it to be lightly golden. Remove from the oven and allow it to cool for a few minutes. Turn the oven down to 180c/160c/gas mark 4. Spread a generous layer of raspberry jam on to base of the pastry and set to one side. For the sponge, beat together the butter and golden caster sugar until light and fluffy. Beat in the eggs, then sieve over the flour and baking powder. Fold these in with the ground almonds, then stir in the almond extract. Spoon the sponge mixture over the jammy base, spreading gently to each side, taking care not to disturb the jam too much. Scatter over the flaked almonds, then pop into the oven for 25-30 minutes. If you find that it needs longer to bake through, check the tin at 10 minute increments. Once baked, remove from the oven and allow it to cool completely in the tin. Not only does this make a scrumptious dessert or tea-time treat with a mug in the other hand, but it's also a bake sale classic, so if you ever need to raise some funds, these guys are the way to go! I'm feeling so inspired by this raspberry and almond combo, so keep your eyes peeled for bakewell-inspired cupcakes in the future.